There is one positive aspect in my opinion with UNC winning the championship in 2017. UNC didn’t have what is referred to as “One and Done” players. That term was popularized after superstar type players only spend one year in college and then jump to the professional ranks. In the past these talented players would have just skipped college ball altogether and entered the pro ranks right out high school, but in 2005, The NBA instituted a new ruling stating that a player had to be at least 19 years old to enter the NBA draft, and thus the “one and done” era began. The program that has recruited the most “one and done” players is the University of Kentucky coached by John Calipari. They have built their teams around young, extremely talented players who stay one year and then move on. For the most part, this has been a successful approach and Kentucky has one many a game and played in several National Championships since the year 2000 winning one time. My Duke Blue Devils lead by the legendary Duke coach, coach Mike Krzyzewski (AKA Coach K) have also adopted the “one and done” philosophy in recent years. They have been very successful winning a national championship in 2015 lead by Jahlil Okafor. Tyus Jones and Justise Winslow (All freshman). These fantastic freshmen all turned professional following their Freshman year and the Championship. Duke has had several “One and Done” players other than the trio that lead the 2015 National Championship including Corey Maggette, Kyrie Irving, Jabari Parker, Jayson Tatum, and Harry Giles among others. Not quite Kentucky, but close. 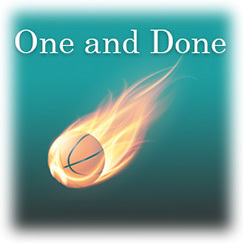 I think the Jury is still out as to whether “One and Done” is the way to go. On One hand these players who play only one year in college are super talented and most end up doing well at the next level(AKA the NBA). If you are a college coach and recruiting these players, do you just say “nah, that’s ok” if you know they won’t be on campus long? Look at the 2017 National Champions in Men’s basketball – The UNC Tarheels. A very talented and cohesive unit. The Tarheels had some very good players in winning it all, don’t get me wrong. they didn’t have the five-star blue chippers though that ranked in all of the best of when they were in High School. This has not been a bad thing for UNC, at least not yet. They have shown that 5 really good players that play well together and stick around for more than one season can do just as well if not better than Duke and Kentucky who are able to land all of the top talent coming out of High School but are only entertaining these players for a short time.